Friday May 10th 1901 I was busy about the house work a great part of the forenoon. finished Ida's waist in the afternoon and began a skirt for myself. 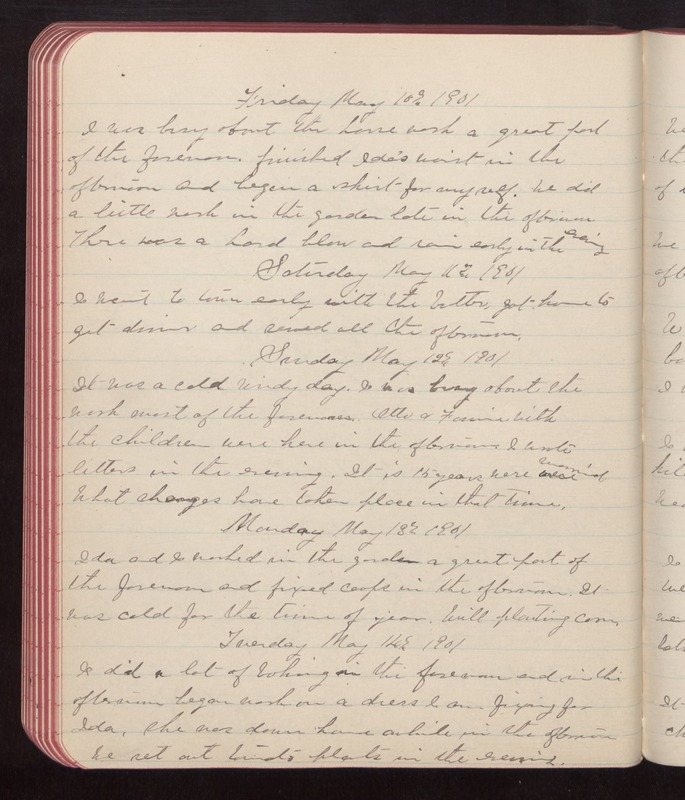 We did a little work in the garden late in the afternoon There was a hard blow and rain early in the evening Saturday May 11th 1901 I went to town early with the butter, got home to get dinner and sewed all the afternoon. Sunday May 12th 1901 It was a cold windy day. I was busy about the work most of the forenoon. Otto & Fannie with the children were here in the afternoon. I wrote letters in the evening. It is 15 years were married. What changes have taken place in that time. Monday May 13th 1901 Ida and I worked in the garden a great part of the forenoon and fixed coops in the afternoon. It was cold for the time of year. Will planting corn. Tuesday May 14th 1901 I did a lot of baking in the forenoon and in the afternoon began work on a dress I am fixing for Ida. she was down home awhile in the afternoon We set out tomato plants in the evening.